Established in Bristol in 2017, King and Webbon design and hand make freestanding and fitted furniture that creates a joyful connection between user and object. Alongside a portfolio of bespoke commissions from stools to kitchens, K&W have an expanding signature furniture range that focuses on simplicity, texture and colour. Founder of King and Webbon is designer-maker Andy King. Originally from an engineering background, Andy’s passion for woodwork developed as a child while working alongside his Dad, a carpenter of over 50 years. 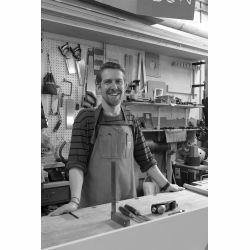 This inspired Andy to change career and train as a furniture maker, with a focus on designing and making furniture that is beautifully crafted and environmental responsible.